Androscoggin Bank’s MainStreet Foundation is pleased to announce the recipients of its quarterly impact grants for the third quarter of 2017. Recognizing a need for at-risk kids in Maine to be safe, healthy, active, happy, educated and nourished, MainStreet Foundation awards impact grants four times each year to organizations actively working to help Maine kids thrive. The grants vary based on the need and are awarded in amounts up to $5,000. The Ecology School (Saco) – $1,820 was awarded to this Saco-based nonprofit to support the delivery of EcosySTEM, a unique multi-year ecology program, in the RSU 16 school district (Poland, Minot, Mechanic Falls). Maine Academy of Modern Music (Portland) – $2,700 was awarded to this Portland-based nonprofit to help in their efforts to bring innovative, inclusive musical education to youth ages 10-18 regardless of a family’s ability to pay. The Caleb Group/River Valley Village (Lewiston) – $2,500 was awarded to this Lewiston-based nonprofit to support a partnership with ArtVan to provide therapeutic arts programming to their residents. YWCA Central Maine (Lewiston) – $2,000 was awarded to this Lewiston-based nonprofit to support their efforts to expand the capacity of their afterschool program through the employment of a youth development specialist. “Each of these organizations is making a difference in the lives of Maine families. Their good work deserves both recognition and support, and it is an honor to support them through the MainStreet Foundation, ” said Steve Closson, Chairman of Androscoggin Bank’s MainStreet Foundation. In the first and second quarters of 2017, the MainStreet Foundation awarded a total of $20,600 to four Maine nonprofit organizations. In addition to the quarterly awards, MainStreet Foundation accepts applications from May 1 through July 31 of each year and selects one winner for the annual $25K for Kids grant, a special gift focused on a non-profit that makes a positive impact in the lives of as many kids as possible. 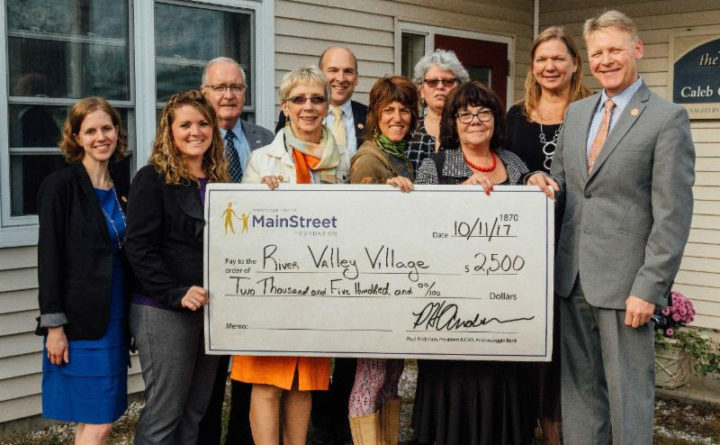 The 4th Annual $25K for Kids Grant was awarded to Preble Street Teen Center in Portland during the MainStreet Foundation Annual Meeting on November 17, 2016. Focused on its mission of providing the three essentials of life – food, shelter and security – to as many children as possible, the $25K for Kids award was presented to Preble Street to help it maintain and expand its services to children and teens. The MainStreet Foundation is Androscoggin Bank’s $1,000,000 Foundation with a mission that is simple, focused and essential: to help keep at-risk kids in Maine safe, healthy, active, happy, educated, and nourished. Four times a year, MainStreet Foundation makes grants (up to $5,000) to excellent non-profit agencies actively working in our communities to help kids thrive. These grants vary based on the need and typically exceed $50,000 per year. In 2011, Androscoggin Bank pledged to donate $100K to the MainStreet Foundation in honor of outgoing Bank President Steven A. Closson. With this gift, MainStreet is able to offer four $25K individual grants, one in each year starting in November of 2013. For more information, visit www.mainstreet-foundation.org. Androscoggin Bank, headquartered in Lewiston, Maine since 1870, is dedicated to serving the communities of Maine, its residents and the business community. As of 12/31/16, Androscoggin Bank had assets totaling $902,236,921. Delivering smarter banking services and products is our commitment, every day. Androscoggin Bank is Member FDIC. MainStreet Foundation Board Members (L to R) Melissa Runstrom, Lacey Gammon, Lee Upton, Lena Hann and Bruce Miller with Jane Loechler, Debbie Nutter, Lori Nahken and Jamie Silvestri of River Valley Village / The Caleb Group. Androsoggin Bank President Paul Andersen (far right).